the time has come, when I am delighted to offer you wrap up of #IS’s reading take away(s) from June 2011. It was “beautifully designed -> enchanting -> run with wise people on the path to -> unfettered mind.” Thank you Garr, Guy, “Born toRun Chris” and Takuan for making my stay in Dubai even more life – transforming! I have picked up copy of Garr’s book in Dubai, where I have ordered it in one bookshop in August last year. Hats off for Dubai’s bookshop, that they kept it for me for more than 10 months – I totally dig level of customer service in this city…But, back to Garr’s book about Simple Design Principles and Techniques to Enhance Your Presentations. 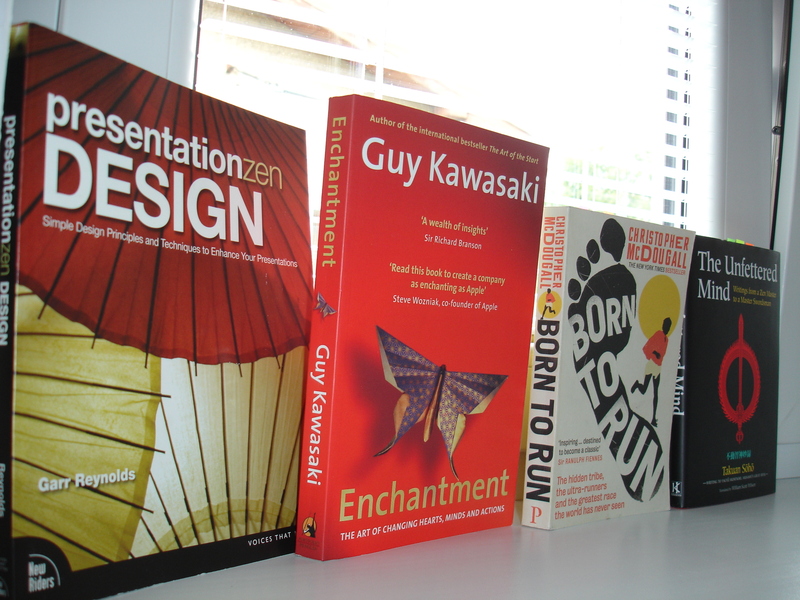 I have been learning from Garr for more than 2 years -> from his blog Presentation Zen, from his personal Posterous blog, from his tweets aka @presentationzen, from his talk(s) over internet, from Garr’s slide-decks on Slideshare -> so getting his book was like a treat/souvenir for me. I bow to Garr for his persistence to teach our world how to design cool presentations. Don’t get confused that this book is only for those who are into public speaking! -> Not at all, this book is for everyone, who is creating digital documents. If you are a teacher, consultant, entrepreneur or simply a life-long learner Presentation Zen is must have for you. Guy Kawasaki’s (@guykawasaki) latest book Enchantment -> The Art of Changing Hearts, Minds, and Actions was a very joyful reading -> joyful as his author. Important lessons for your professional and personal life, written in a reader friendly lingo, well designed, with true stories at the end of each chapter. Even in this case, I have bought Guy’s book as a gift to myself -> after learning 2.0 from Guy for over 2 years online. Get enchanted with Enchantment, too. In case of this tiny tiny book with subtitle -> Writings from a Zen Master to a Master Swordsman, we could quote Yoda from Star Wars: ” Size matters not! Judge me by my size do you?“[watch this one minute long video if you have not seen it yet]. The Unfettered Mind was astonishingly insightful and its concepts were and still are so difficult to grasp with untrained mind. Great call to action for everyone who seeks the Way. Read it. Live by it. Be it. Quotes of the month column goes to Takuan Soho’s -> The Unfettered Mind. If ten men, each with a sword, come at you with swords slashing, if you parry each sword without stopping the mind at each action, and go from one to the next, you will not be lacking in a proper action for every ten of them. Later, as day pass and time piles up, in accordance with practice, neither postures of his body nor the way grasping the sword are weighted in his mind. His mind simply becomes as it was in the beginning when he knew nothing and had yet to be taught anything at all. Not stopping the mind is object and essence. Put nowhere, it will be everywhere. Even in moving the mind outside the body, if it is sent in one direction, it will be lacking in nine others. If the mind is not restricted to just one direction, it will be in all of them. The Confused Mind is like ice, and ice is unable to wash hands or head. When ice is melted, it becomes water and flows everywhere, and it can wash the hands, the feet or anything else. Simply do not think about not thinking at all. Employ men who are good and bind them to you, reflect on your own deficiencies, and put men who are not good at a distance. To be pleased once with an ignorant man, to take a liking to him and to give him an appointment while not using the good man that is there, is the same as having no good men at all. Good man is regarded as a jewel by the province. You should make this your own personal experience. Dying because someone vexed at being insulted resembles right-mindedness, but it is NOT that at all. This is forgetting oneself in the anger of the moment. It is not right mindedness in the least. Its proper name is anger and nothing else. When a man praises another in glowing terms, such words are likely to be returned to him as well. Not departing from desire, but realizing a desireless rigth-mindedness – this is the Way. Given Form, Nature, Embodiment, Power and Function, no matter what is done, it can be done at will. When you who treat others so cruelly try to love. If we see differences it is due to narrowness of our vision. Not understanding the principle of things, people often put on knowing faces and criticize those who do understand. And while they seem to be laughing at others, they are really laughing at themselves. At least those who truly understand must think so. Those who study the Way are absolutely diligent for ten to twenty years, twenty four hours a day. This mind was not born with your birth and will not die with your death. what did you read in June? Have you read any of the books #IS did? Do you fancy to get a copy of any books mentioned above? If yes, which one and why? Over to your heads now. Start, repeat and new habit will evolve.